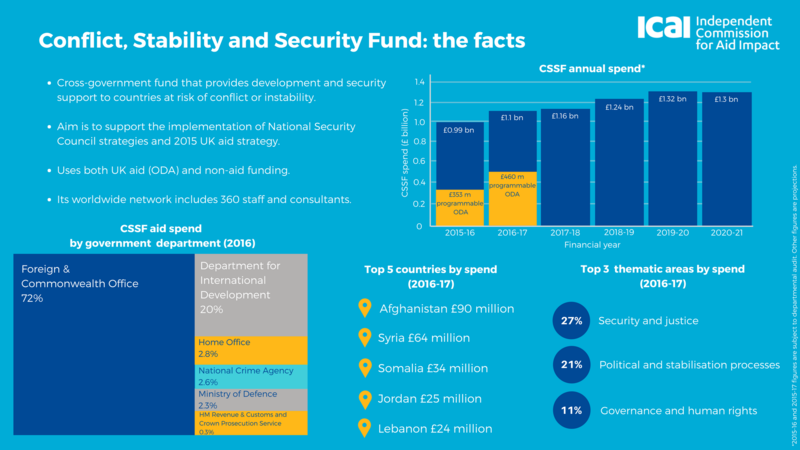 Shortcomings in aid programmes delivered as part of the government’s CSSF are undermining its contribution to building peace, stability and security. The intensification of destructive conflict in a number of countries and regions since 2010 is widening the poverty gap between conflict-affected and other developing countries. By the end of 2016 there were 65.6 million refugees and internally displaced people globally, with 84% of them living in developing countries. The total number of displaced people has increased substantially since 2010, due mainly to a few large-scale conflicts: in 2016, 32% of the global refugee population were Syrians, while refugees from Afghanistan, Somalia, South Sudan and Sudan together made up another 32%. It is estimated that by 2030 nearly half of all people living in extreme poverty will live in conflict-affected places. Over the past decade, the UK government has significantly increased its aid to fragile and conflict-affected countries and regions. The Conflict, Stability and Security Fund (CSSF) is one of its main instruments for tackling conflict and instability. Accessible to a range of government departments it combines Official Development Assistance (ODA) and non-ODA funding to support the implementation of National Security Council (NSC) strategies. The CSSF was established in April 2015, as the latest in a series of cross-government conflict prevention funds that stretch back to 2001. Its initial annual budget of £1 billion is set to rise to £1.3 billion by 2020-21. This review only looks at the CSSF’s aid programming expenditure, which in it’s first two years of operation amounted to £353 and £460 million (or 34% and 41% of the CSSF’s total spending). ICAI assessed whether the CSSF takes a relevant and evidence-based approach to spending ODA on addressing conflict, instability and insecurity, whether its programming is likely to be effective, and how well it is learning from the available evidence and its own experience. Overall we awarded the CSSF an amber-red score. will achieve, and the assumptions that need to hold for this to happen. should be explicit and progress reported so that the value for money of the investment can be confirmed. results management and measures to assess value for money. reviews and evaluations of the Fund’s work should be undertaken where it is possible to do so. partners in the form of thematic guidance. Parliament’s International Development Committee (IDC), or its ICAI sub-committee, hold hearings on all ICAI reviews. The IDC hearing on the Conflict, Stability and Security Fund’s aid spending is available to watch online.